We carry an exceptional grouping of clothing, classic linenwear with a twist and statement accessories that are perfect for a casual luncheon with the gals, a cowboy ball, or a sophisticated evening in town. We are proud to carry Hearts Desire by Mary Grace, Betty Hadikusumo, Tina Givens, CP Shades, JohnnyWas, AyalaBar Jewelry, Mariana Jewelry, Ropin Leather Goods and much, much more. Enjoy our special personalized service when you come to browse, be it for a small gift for a friend or a refreshed wardrobe. We are located in South Central Texas, on the edge of the Hill Country, with full locations in Bellville (on the Square), and Round Top (in Bybee Square). 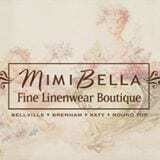 Come in and join the fun, MimiBella would love to meet you.